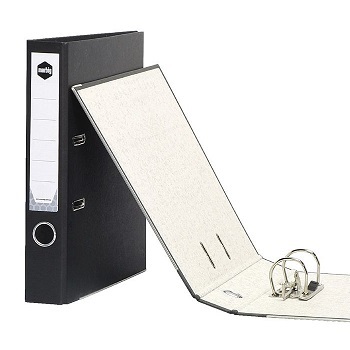 Perfect for when binders are too small and lever arch files are too big. Includes a locking lever arch mechanism to keep pages secure and Rado fitting for easy closure. Finger Pull (hole in the spine) allows you to remove the file easily when files are sitting together on a shelf or in a cabinet. Price each - Order 20 to receive one box. 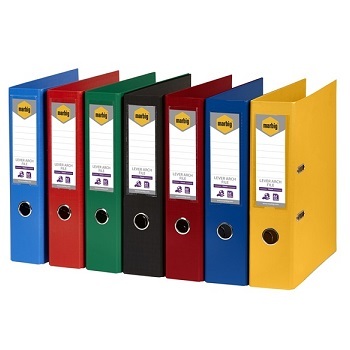 Durable, moisture resistant Polyethylene (PE) Lever Arch Files in fashionable colours to spice up the office! Cover is non-toxic and earth friendly with a stylish linen finish. Rado fitting allows easy closure so you can fit more on your shelf. Spine label for easy identification. 70 mm capacity - A4 size lever arch files. 75 mm spine holds up to 375 sheets of paper. Available in a choice of 7 bright colours. Available in a choice of 7 standard colours. Reinforced spine creates extra strength and flexibility. Rado fitting allows easy closure, so you can fit more on your shelf. Spine label for easy identification of contents. 70 mm capacity - Available in both A4 and Foolscap size. Made with 100% recycled board. 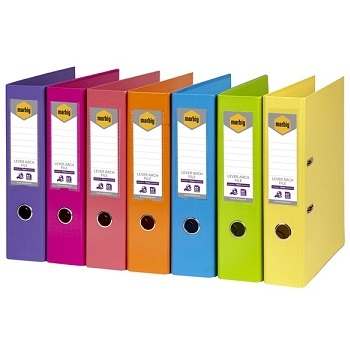 Quality spring coloured board lever arch files to brighten up your office decor. Rado Fitting ensures the front cover of the file locks shut ensuring space maximisation on a shelf or in a cabinet. Finger Pull (hole in the spine) and spine label for easy identification of contents. 70 mm capacity - A4 size board lever arch files. Available in a choice of spring colours. Relax and reflect - with calming Cosmo Pastel colours for your organisation needs. Unique Strong-line reinforced lower edge provides extra protection. Metal reinforced finger hole. Rado front cover locking. Interchangeable and reversible spine label. 70 mm capacity - A4 size durable PVC lever arch files. Available in a choice of pastel colours. Unique Bantex Strong-line reinforced lower edge provides extra protection. Extra Capacity Environmentally Friendly Polypropylene Lever Arch Files. Heavyweight board, tear-proof material and metal reinforcement strips for longevity. 100% recyclable, 70% biodegradable and made from 70% recycled material - Free of volatile organic compounds. Available in a choice of standard colours. Bantex A5 Lever Arch Files with strong-line reinforced lower edge for extra protection. 70 mm capacity - A5 size durable PVC lever arch files. Available in either Black or Blue.